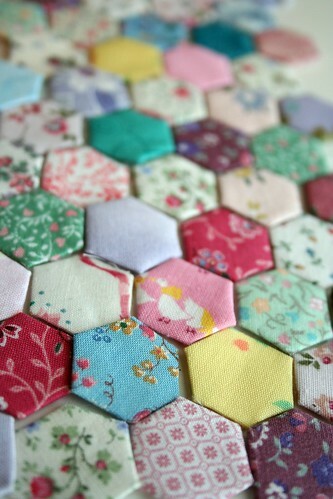 Now that the french knots are temporarily put to rest, I am back to the hexagons. 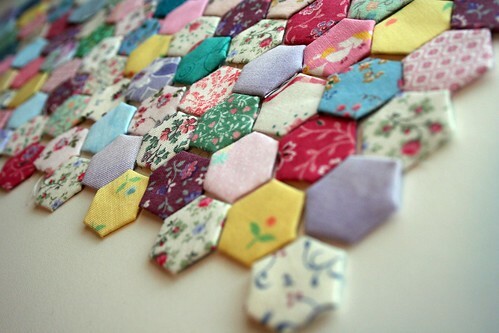 Last night, I pulled out the box of basted hexes and laid them out randomly, testing out color combinations and feeling very satisfied with the results. This project definitely does chew up a lot of time. 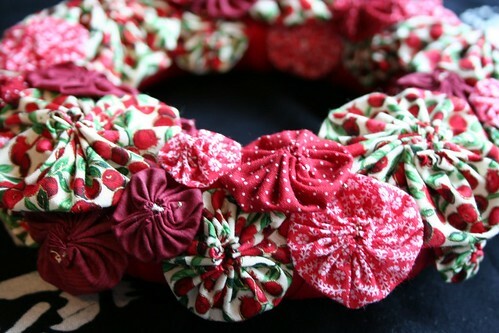 But, I find the stitching so meditative and a little bit sweet, so I don’ tmind it at all. 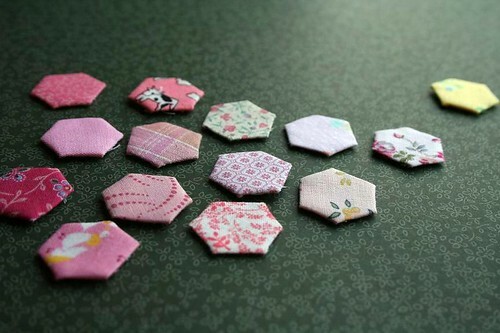 Because the hexes are so small, it’s a breeze to do this work during my subway commute. I’ve got my supplies packed in a small plastic container and as long as I’ve got a seat, I can stitch about 10 hexes before I get to work and another 10 on the way home. My parents were visiting for the weekend, which means that I didn’t get any of my chores done (laundry? food? shopping, anyone?) 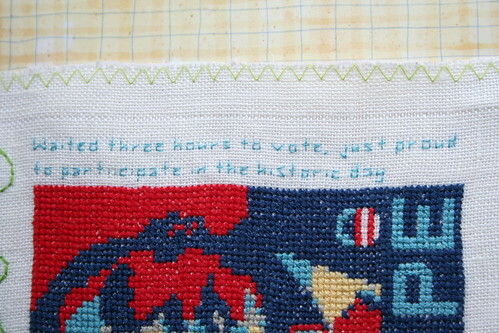 but I did get to spend three days stitching, designing, and laughing. My mom is a very talented seamstress who spent the last 30 years raising her 7 children. 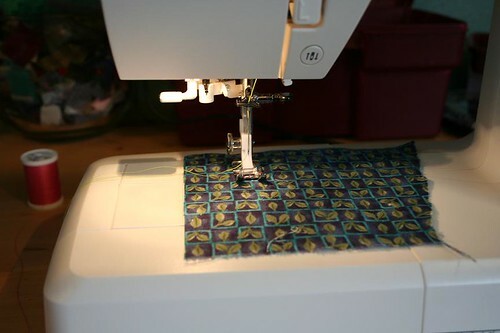 In the past few years, as the last of us have finally moved into adulthood, she has made more free time for sewing, and gravitated toward quilting specifically. 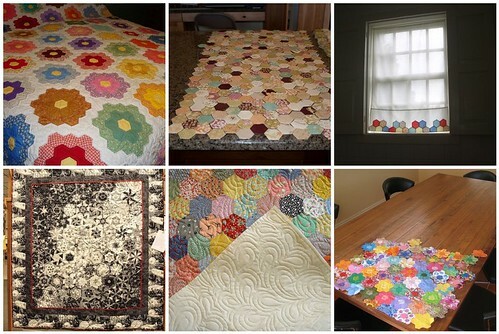 Every Tuesday night, she and two of her neighbor friends move into a large sewing room that one of them owns. 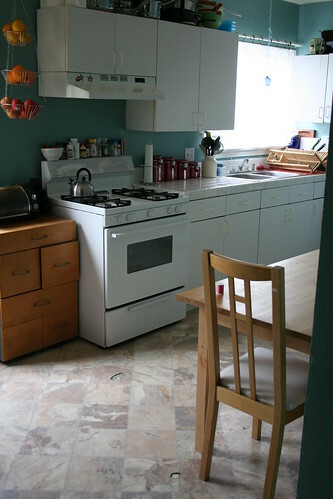 It has a design wall, a television set, a mini refrigerator — you get the idea. Basically, it’s a needle-and-thread bomb shelter from the rest of the world. Mom calls Tuesday her “sanity day” and on particularly tough non-Tuesdays, she’ll sneak over there by herself to work. It’s kind of inspiring how she uses her chosen medium to regulate emotions and frustrations, connect with others, and find an inner center. 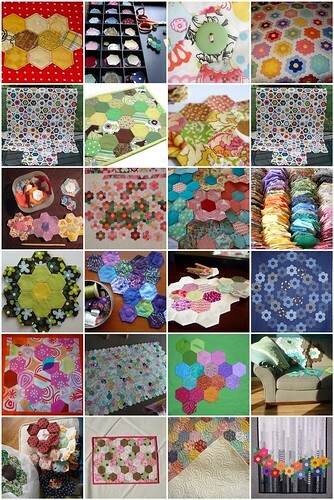 My mom also buys lots of books, takes lots of classes, and meets lots of other quilters. 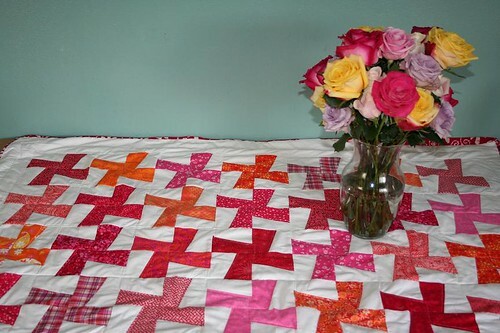 I, for my part, am a child of the Digital Age and because my mom lives far, the nearest thing I have had to a quilting tutor is the internet with its crackling circuits and bytes. It’s not exactly the most nurturing of teachers, but in this day and age it will have to do. 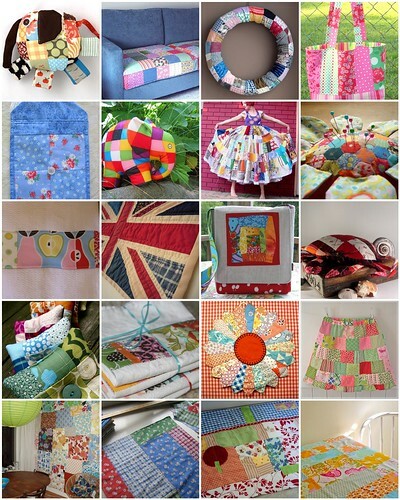 Mom wanted to see what I’ve been working on, so I showed her some of my recent successes — the doll quilt on the wall (I’m sorry! I just think it’s cute! 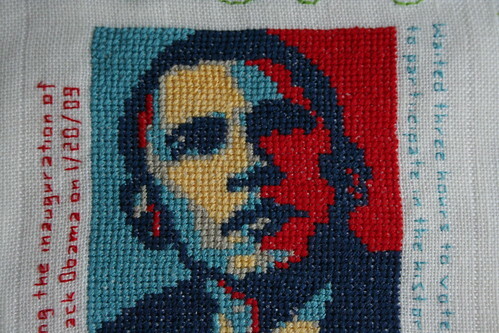 ), the Obama cross stitch (with some trepidation, as our politics are quite different), and the next installation of my band sampler (stay tuned for photos). What I most wanted to do, though, was share my recent frustrations and failures. I knew she would have fixes and solutions for me. I, as a visual learner, would benefit from her wisdom as she sat next to me, demonstrated with her able fingers, and brought clarity to my confusion. A few times, I asked her questions whose answers I already knew. I enjoyed making her feel wise and important and smart. I wanted to soak in the look on her face and savor the moment. As we sat there together, chattering away, needles in our hands, I felt something deep and primal and wonderful at work. 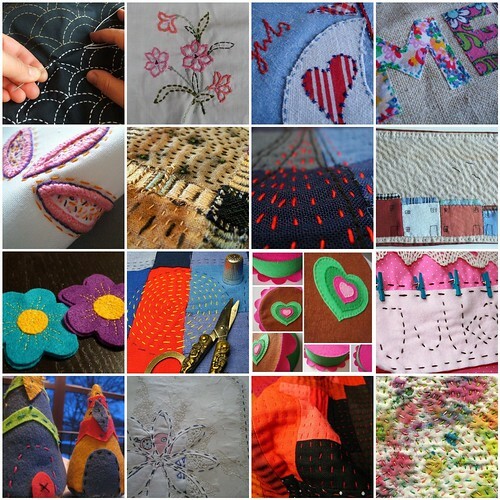 We were taking our part in the cycle of textile arts — one generation learning from another. For various reasons, I have more memories of that experience with my grandmothers than with my mother, so it was nice to close the gap a little bit. 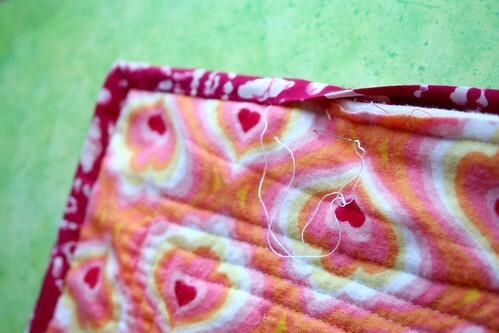 Plus, she taught me the neatest binding stitch I’ve ever seen. 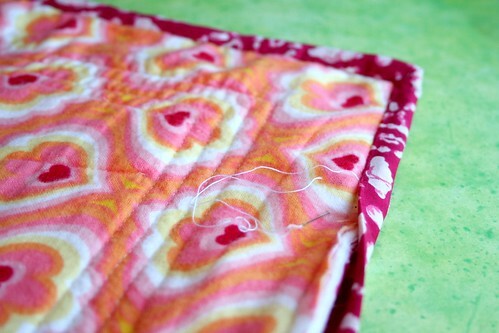 Armed with this little finishing gem, I think I am going to quilt like crazy, now. What about you? Who is your best teacher? Do you teach yourself? Have you had a generational moment like this? A recent idea for a project was going to require some problem-solving. Things in my life this week feel extraordinarily complicated. Craziness is firing on all cylinders, and much of my free time has been drowned away in worry and doubt. Resolving the project was going to push me beyond my current skill set. It was going to lead me out of my comfort zone and force me to take a hard look at my mistakes. Originally, I tried to solve the problem the way I always do — by thinking, plotting, and obsessing over it. Obsessing, though it is my preferred mode, is not always the best way to solve problems. Even cognitive ones. Sometimes, taking a breath and getting to work is the only thing to do. I needed this reminder — to stand still and tackle one hurdle at a time. To slow down and peacefully experiment. To stop rushing and obsessing and pushing. To take action, but calmly. To give myself permission to fail, but insist on trying anyway. It was nice to have a reprieve from making things by machine for the past few weeks, but I pulled out the ol’ Husqvarna Viking last night to finish a gift for a friend. She has been giving up coffee and trying to drink more tea. 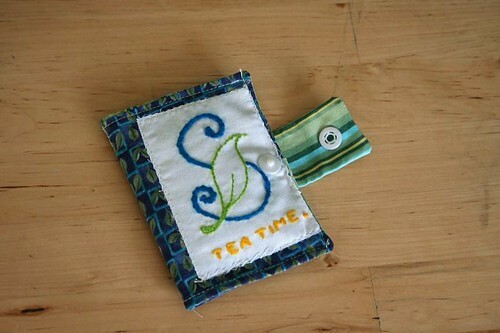 When I found the tutorial for a tea wallet over on Christy’s Creations, I knew it would be perfect for her. Even though she is one of my best friends, assembly of her gift came at the end of my great and grand handmade holiday list last year, and so it had some problems that were created by rush, short-cuts, and sloppiness. Sure, it has a snap, but not even my obsession with snaps can override the gross errors in this piece. In fact, I think it was my precious love for snaps that made this project go wrong. I wanted it to be in just the right place, but didnt plan correctly for it. So, here’s how I spent time the other night — re-doing, slicing, and fixing a previous work. In spite of what I may have said yesterday about proudly being an imperfectionist, I feel strangely satisfied. For reasons which will be incomprehensible to many people who read this entry (but are nonetheless real), I have been broken up with my ex-boyfriend since June of last year. I mention this in part because of how grateful I am that we have remained friends; we see each other often, and have a deep caring and concern for one another. When I ended up hospitalized after my “same-day surgery” debacle and needed someone to not only take emergency custody of my dogs but also to speed over and hold my hand, he was the first person I called. When I’m having a bad day, have a ridiculous idea, or need someone to geek out with, I reach out to this wonderful person and he is there. I love him. 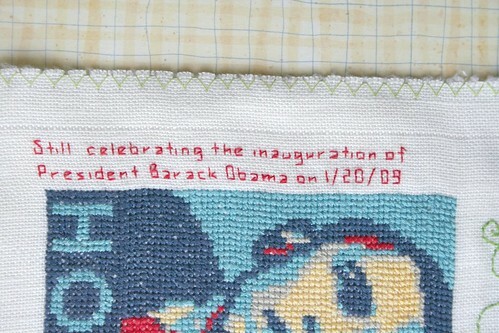 When he saw me working on my cross-stitch Obama a few weeks ago, he got so excited that he wanted to make one, too. I was happy to oblige by teaching him how, but he had some special requests. We bought 11-count Aida cloth. He is stitching over two squares for each X, which makes it essentially 5.5-count Aida cloth. He is using two full threads of DMC floss in every needle, for a total of 12 strands in every stitch. It’s always interesting to teach and observe someone else in a skill that you have employed for a long time. 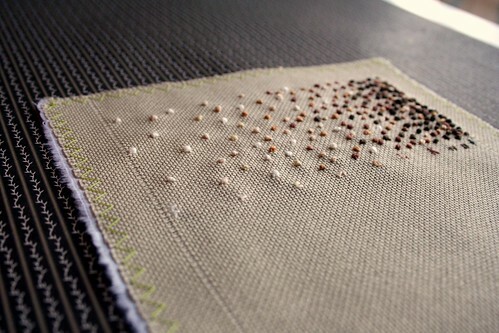 He is so careful in his stitching — he wants the back of his stitchery to look immaculate. He is very interested in the idea of embroidery contests and judging (such as when my brother-in-law and nephew enter their cross-stitched pieces in the county fair) and wants to be sure he is doing everything right. I try to explain that “there is no right” (and especially not on a first-time project! 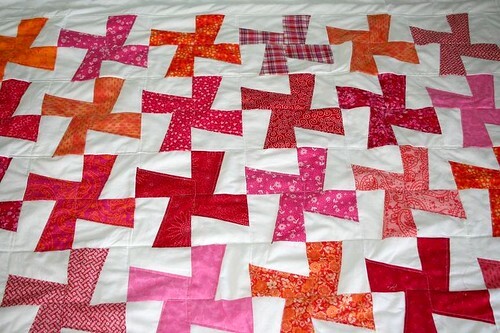 ), but he’ll tear out rows of stitches if he feels that one is a little too loose or too tight. For my part, I am much more interested in the process than the product. 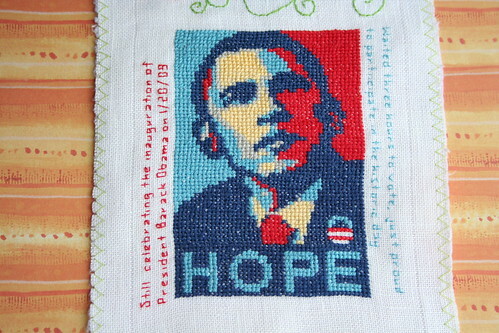 If you look closely at my Obama, you’ll see gross errors in counting, alternating, and snipping. I try to make the back of the piece tidy, but sometimes I run out of steam for starting-stopping and will skip around a bit. Still, the overall effect is pretty good and it suits my purposes well enough. But no — oh no — no such flojera will be brooked with that guy. He is precise and careful and determined. The back of his piece is so beautiful it would make both of my grandmothers proud. Incidentally (and, this will probably not come as a surprise to you), describing these differences in our stitching style encapsulates some of the main differences between us as people. What about you? Are you more likely to obsess over the process or the product? Are you a perfectionist or an imperfectionist? Do share. 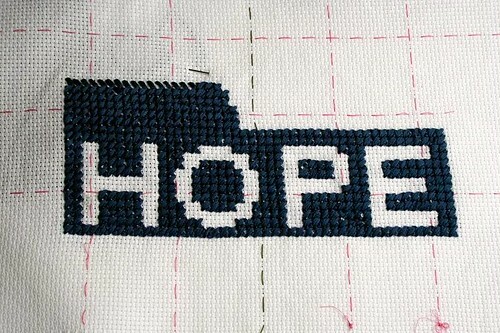 I blogged a little bit before about what stitching has meant to me, emotionally, over the past few months. In November, I had a simple surgery which was complicated by surgeon’s error and has led to a long and drawn out recovery. 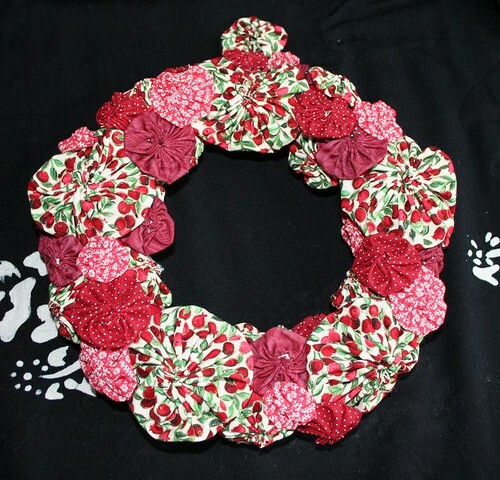 This wreath made of yo-yo’s was the first of the stitching projects I started after I returned home from the hospital and has hung on my front door long past its season. 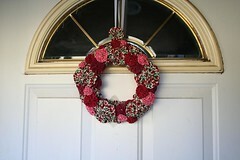 The other night, I took it down and started disassembling it, making way for a new wreath project to take its place. 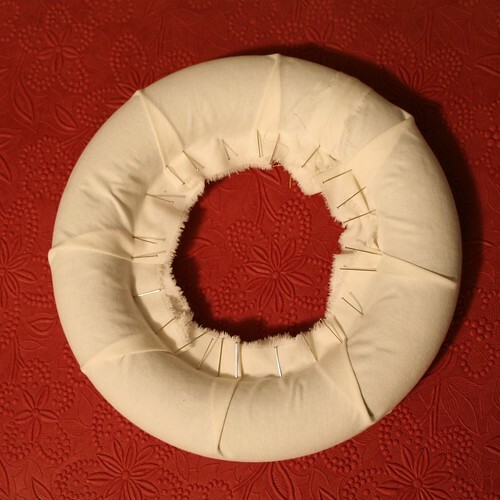 I was pleased by the meticulous, careful detail of these handsewn circles, and the foresight I had to assemble the wreath entirely with straight pins. I guess I made it with the intention of disassembling it at some point, because it has all come apart with its pieces intact, and could be re-assembled at any point. In some ways, I think that the trauma and anxiety of the surgery aftermath is a big part of what has been holding me back recently. Something about disassembling this project has been therapeutic — an un-doing of what has been done. A preparation for moving on to the next thing. Maybe it will help me break up the muddle I’ve been feeling. If nothing else, it will make way for a new season — for spring — with its longer days and new growth. What about you? What are you doing to get ready for spring? How do you become un-stuck? 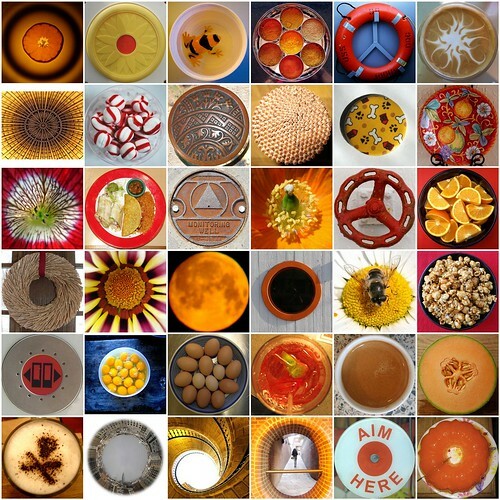 I have been following a lovely little website called Creative Therapy which celebrates the art of visual journals. The site serves as a community for creative/visual journalers, and its administrator, Karen Grunberg, puts forth “catalysts” (journaling prompts, basically, but with an awesomer name) to which the CT team responds. She then invites readers to respond as well, and to post links to their creations. Each contributor is invited to write about their project and their process, which can be really illuminating. This is something I often do with my art therapy clients, as it can sometimes facilitate a better connection between our rational and emotional selves. On the practical side, you can learn new techniques from these artists’ blurbs. On the emotional side, you can really get a feel for the way that creating these responses has touched people. As you know, the emotional side of art-making is something that interests me very, very much. Karen tries to eliminate the all-too-common air of competition which can seep into these kinds of community ventures. She seems to truly celebrate creativity and personal expression and to genuinely encourage it in others. There is a spotlighted artist for each catalyst, and it’s often someone I’ve never heard of (though some famous faces have made appearances). The site has sponsors who sometimes do giveaways. Not that any of us need extra stash, but… I do think it speaks to how involved and proactive Karen (and maybe her team?) has been. 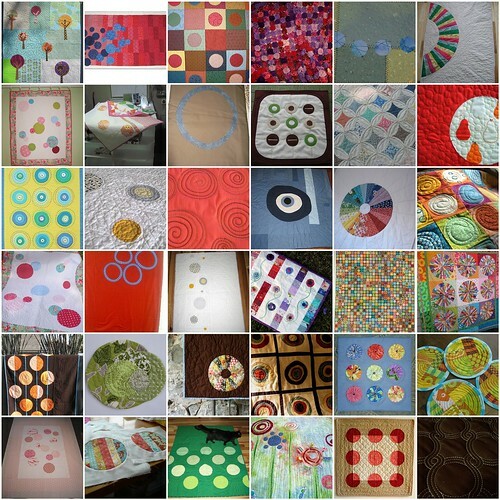 The responses seem to be largely grounded in the world of scrapbooking, altered books, and other popular paper-based arts, but are not exclusively so. For instance, a recent response to Catalyst 50: What is something that you turn to, to lift you up out of a bad mood? was a crochet project made by Debee Campos. 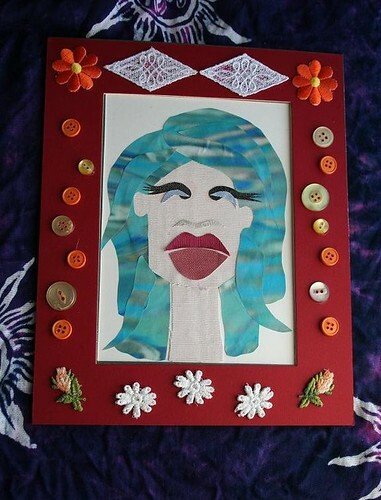 Debee graciously gave me permission to post her artwork and words here, because I feel they really speak to some of my own explorations about the emotional impact of various art media. In this instance, Debee writes about the experience of learning and practicing crochet. I’ve recently taken up the art of crochet. And just in the nick of time. Wedding planning. House hunting. Future dreaming. All have left me a little chaotic. You would think it’s crazy of me to take up crocheting during this crazy phase of my life. But in fact it has helped silence my thoughts. During these times of learning and practicing the rhythm of the process, I have found my thoughts are all hushed. My time has been well spent. Thinking pondering and praying. There are times when I just listen. And most of the time I’m not such a great listener. It has also helped my patience level But the combination of the two has helped my outlook on all the things I’m juggling. I find this time to be the best at bringing peace to my heart. All the while I am bursting with pride taking up a lost art in my family and creatively expressing myself in another form. This is for sure something I hope to continue throughout my life. 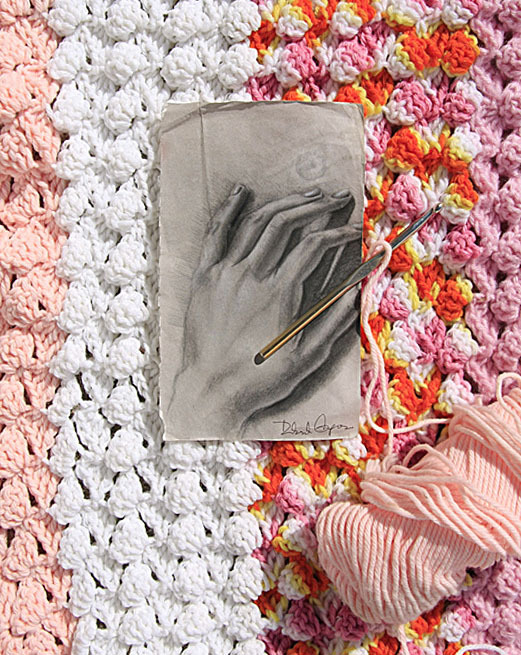 I laid a drawing I drew years ago of one of my hands over the top of my blanket that is still a work in progress. I felt like it fit the picture perfectly. 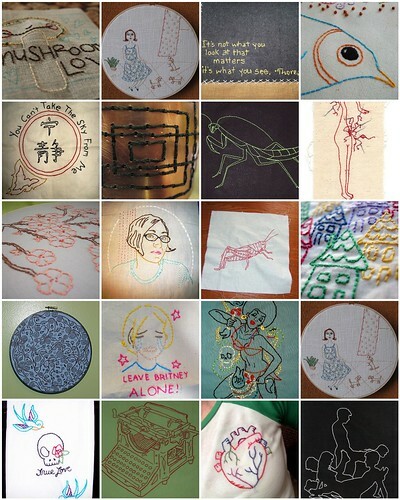 As drawing was once my quiet time long before scrapbooking and crochet came into my life. How about you? Have you ever used journal prompts or participated in some kind of creative community? Do you keep a visual journal? Why or why not? Recent social obligations (out-of-town guests, dates that I knew would end up at my place, drop-by visits from the neighbor’s kids for playdates with the dogs, etc.) have necessitated a quick and temporary return to regular, adult living. 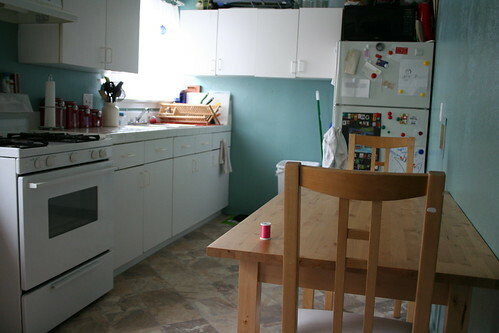 What I mean by this is that I have temporarily reclaimed my kitchen. Sadly, my sewing machine (which had resided on my kitchen table for months) has been packed up and put away for the past couple of weeks. No more late-morning hem repairs as I run off to work. 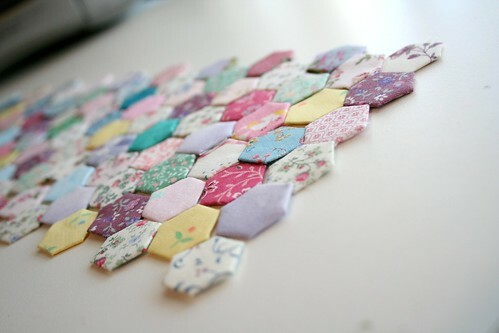 No more lauching into elaborate patchwork projects “because I have a few minutes.” No more midnight sewing marathons to buzz away my insomnia or inexplicably-motivated Adventures in Buttonholes. Maybe that’s okay, though, as it has allowed me to turn my attention to more handwork, embroidery, and other machineless modes. 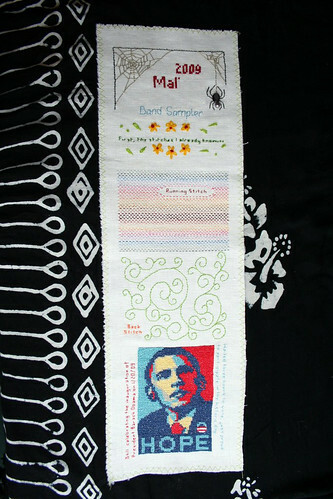 I’ve finally started the band sampler and hand-bound the baby quilt. 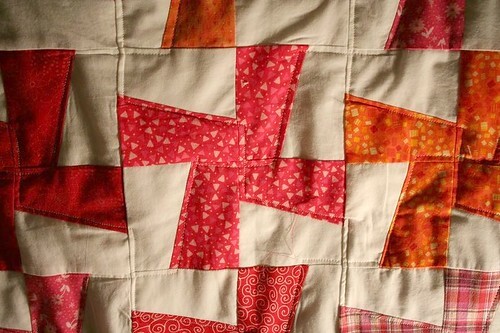 I’ve been exploring a bit with hand-pieced quilting and such. My hands have needlepricks and callouses where there was once fingerprint. I may pull the machine out again this weekend to do some finish work and some mending. A part of me kind of hopes not, though. I’m enjoying the quiet. How about you? Do you have a dedicated workspace, or do you double-dip rooms, as I do? 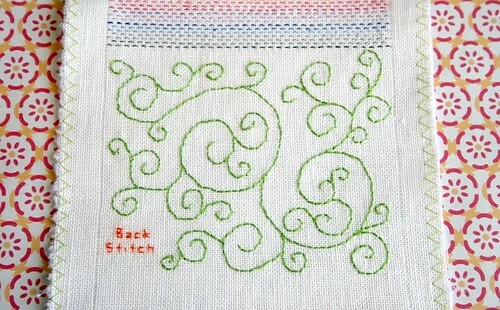 Continuing with the idea of starting the band sampler with stitches that I already know, I dive in to the Back Stitch. 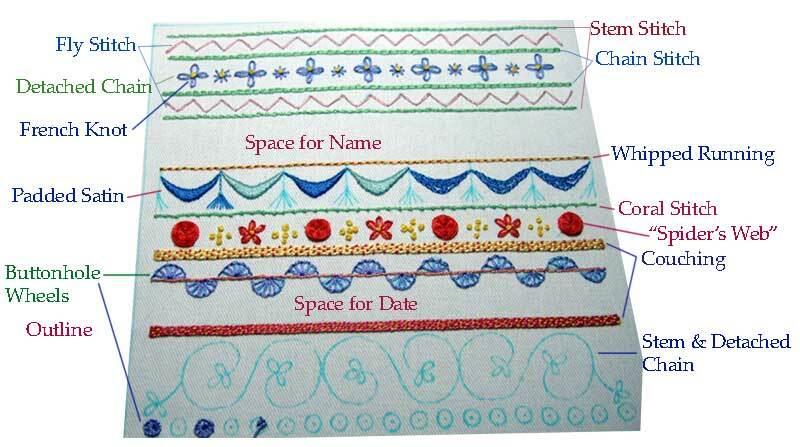 For many years, Back Stitch and French Knots were the only stitches I knew, besides Cross Stitch. I did this up in an evening (note the little pop of orange) a few days before the Academy Awards. I only mention the Academy Awards because why isn’t everyone talking about that one backdrop on the ceremony stage!? 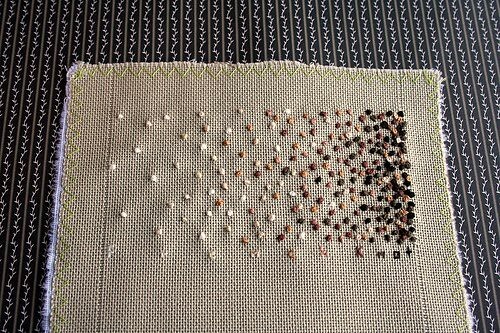 During the presentation of the awards for Best Documentary, there was an amazing, art-deco-esque, scrolled thing that was really beautiful and reminded me of my Back Stitch motif. Maybe we were all too dazzled by the feats of human strength performed in front of it — but this is the only photo I could find of the backdrop (and it came from the Academy Awards official website). Although the video quality is very poor, you can also see the entire segment on youtube and drink in the deliciousness of a scroll-y, swirl-y stage. In the meantime, please share! 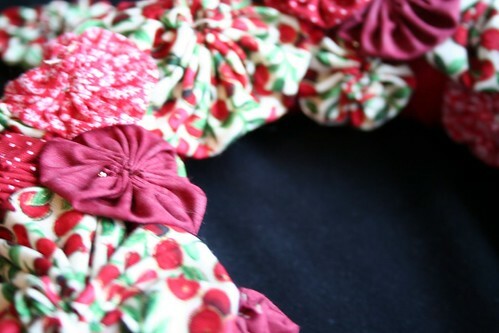 Do you love scrolls and swirls? Do you hate them? 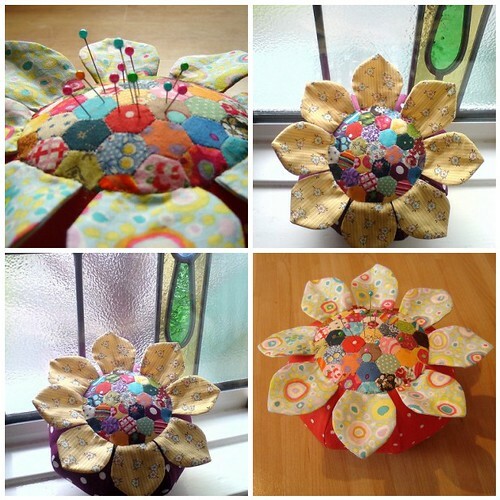 Are there other good stitching tutorials online? What is this girl thinking? Is she sleeping? Is she scowling? She emerged from a collage activity during one of my groups this week, and I’ve enjoyed postulating about what part of me she might represent. Today is Fat Tuesday, Shrove Tuesday, Mardi Gras. There’s a new girl at work from Louisiana, and her mother shipped a traditional King Cake overnight express. 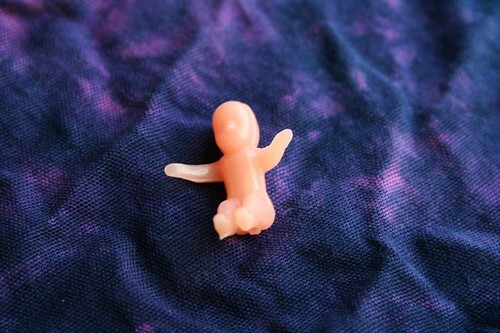 Well, no one explained to me about the little plastic baby baked into the cake, so when I bit into something hard that was all arms and legs, I honestly thought a beetle had traveled to California from Louisiana. But, no. That painful little crunch apparently signified the onset of a year of good luck! Normally, I wouldn’t put too much stock into such a thing, but last night when my back tire popped and deflated not ten feet away from a tire store, when the guys who work there were still cleaning up even though the shop had been closed for over 30 minutes, and when they quickly changed my tire for a reasonable price, I thought: THANK YOU BABY JESUS! I hope I didn’t spend all my good luck in one night. Please share! Have you had good luck recently? Do you celebrate Fat Tuesday or Lent? How do you make traditional celebrations meaningful for you? 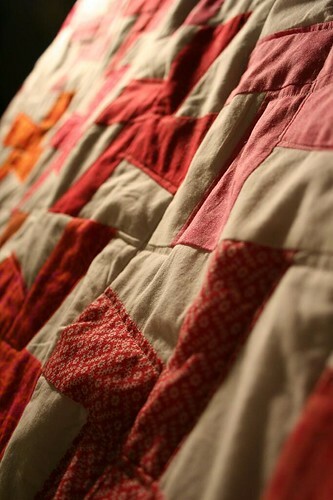 I’ve about finished the baby quilt I’ve been working on. 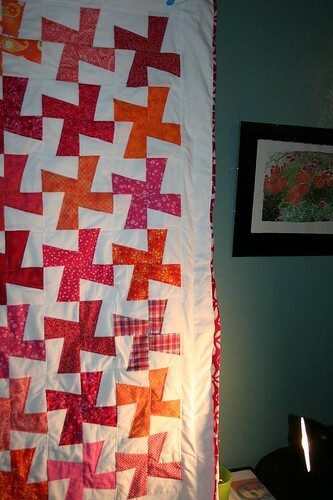 It’s the one patterned off of the mini rough draft quilt. A friend of mine from grad school will be having a baby girl next month. I’m happy for her, and a little bit jealous of the baby! My friend is sweet, and smart, and creative, and good-hearted. That lucky baby will have such a good mother. I grew up in a culture where children and family were valued above all else. Many of my peers married and began having children when they were very young. Some of them have told me how they envy my life. I have two dogs, a career that I love, and an interesting, challenging life. I have the luxury of focusing on myself and my own development. I get a good night’s sleep and ponder the meaning and purpose in life. But I have no husband and no babies and no white picket fence. 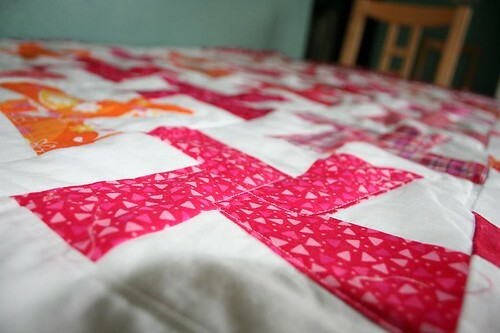 In some ways, making this quilt stirred up some of my feelings about all of that.